We chose the name of our farm to reflect our deep respect for the way of agrarian life in Britain with its tradition of animal husbandry that is wise and sustainable. All over this world (including in Britain) such a tradition is threatened by industrial models of agriculture. 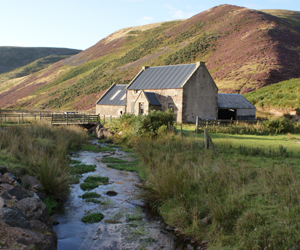 We “borrowed” our name from Heatherhope Farm in the Borders of Scotland. On a visit to that area we were eating in a pub in the wonderful village of Kirk Yetholm when we had a conversation with a shepherd who worked for Heatherhope Farm. When we were yet only dreaming about possibly starting a farm, we talked about possible names. We liked the British tradition of passing down names with properties. Just about every farm there has an interesting name that has been attached to the farm, sometimes for centuries, and that carries along, from generation to generation, something of the heritage and dignity of the place. The affix “hope” and others such as “up,” “hup” or “op” appears many times in British and especially Scottish placenames. There is difficulty in relating all of these usages, but it seems that in the Borders it derives from a Scandanavian word for inlet, or an Old English word for valley or “land haven in an exposed hilly region.” In the Borders they pronounce Heatherhope as “HE-ther-up.” You will find there a Heatherhope Valley with a Heatherhope reservoir that used to supply the town of Kelso with water, and Heatherhope Farm. Place names with “hope” in them number over 100 in the Scottish Borders, with most of them on the slopes of the Cheviot hills, where the name of our Cheviot sheep comes from as well. There are also many such place names to be found in Northumberland, Derby, Gloucester, Hereford, Shropshire and other areas of England. Two of our favorite British shepherds are Bill Elliot, who shepherded at Halterburn, near Kirk Yetholm for 50 years very near Scotlands original Heatherhope Farm, and Ken Gwilliam, who shepherded at Burrow View Farm in Hopesay, Shropshire. 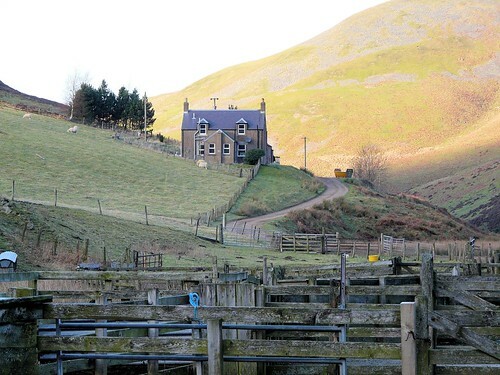 Here is a photo of Heatherhope Farm in the Borders. Our Heatherhope is not nearly as grand or beautiful, but we hope it can be a place of where sheep are kept well and great dogs might be found. Shepherd’s cottage at Heatherhope Farm in the Borders of Scotland. Photo from weirdcrank, posted on Flickr.